1 Pixie C60 Espresso Maker ― what’s the animal? If you consider yourself as a true coffee lover then you must know about the Nespresso Pixie series of coffee makers ― those small masterpieces for home coffee brewing. Coffee machines of the Pixie collection are regarded as ones of the smallest in the world. They combine a brand-new design with a great functionality. Rather low price (less than $120 ) made them one of the most desirable coffee makers for the small households, kitchens, offices and dining rooms. Pixie C60 Espresso Maker ― what’s the animal? Nespresso had worked out the new conception of modern design and functionality combination where one complements the other. Compact, stylish, elegant body of bright aluminum with soft angles has quite an amazing power of pump pressure: it’s almost 19 bars. You can realize this power by knowing that the pressure of 17 bars. is usually enough for espresso brewing! The high-pressure allows brewing espresso in so-called barista-style with saving the most delicate aroma and flavor of each capsule. Coffee out of Pixie Espresso Maker turns out rich, intense with dense unctuous crema on its surface. Nespresso Pixie C60 Espresso Maker can be called one of the smallest coffee machines in the world. 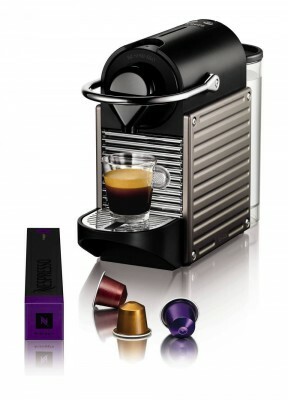 It has only 4.4 inches wide which make it the thinnest one among the other coffee makers from Nespresso collection. You can perfectly use it even when you short of space in your household because having such a compact design Pixie C60 Espresso Maker takes up little space. Pixie Espresso Coffee Maker appears to be very economical in energy consumption. It means that nominally this model belongs to the class A of energy consumption, but in fact, it consumes over 40% less. So you can use it with the same power but your electricity costs will be much lower. Unique power-off function turns the machine off after 10 minutes since the last use. That also allows consuming less energy. Nespresso Pixie C60 Espresso Maker is quite clever to alert you if you need to refill the water tank. This function is unique because the other coffee machines of Nespresso series can hardly detect the water tank emptiness. Red lights along the sidebars will light up when the tank is out of the water. So you can be absolutely sure that your coffee maker is working properly and correct. Pixie C60 Espresso Maker is available in different colors and sidings (see the picture below). Nespresso gives you one year warranty after coffee maker purchase. If you are an avid coffee lover but your budget is rather tight to purchase professional coffee maker; if you are looking for a great combination of beauty and usability in your kitchen; if your house is so small that every inch of space is as precious as gold there ― then Nespresso Pixie C60 Espresso Maker has to become your choice among the huge number of different coffee machines.